Press the I button (1) to turn the automatic- dimming function on. The mirror indicator light will illuminate. Press the O button (2) to turn the automatic- dimming function off. The mirror indicator light will turn off. When programming the HomeLink® Wireless Control System, you may be operating a garage door or gate operator. Make sure that people and objects are out of the way of the moving door or gate to prevent potential harm or damage. Do not use HomeLink with any garage door opener that lacks the safety stop and reverse feature as required by federal safety standards. (This includes any garage door opener model manufactured before April 1, 1982.) A garage door opener which cannot detect an object, signaling the door to stop and reverse, does not meet current federal safety standards. Using a garage door opener without these features increases risk of serious injury or death. For more information, call 1-800-355-3515 or on the internet at www.homelink.com. Retain the original transmitter for future programming procedures (i.e., new vehicle purchase). 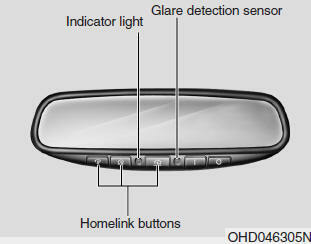 It is also suggested that upon the sale of the vehicle, the programmed HomeLink buttons be erased for security purposes (follow step 1 in the “Programming” portion of this text).